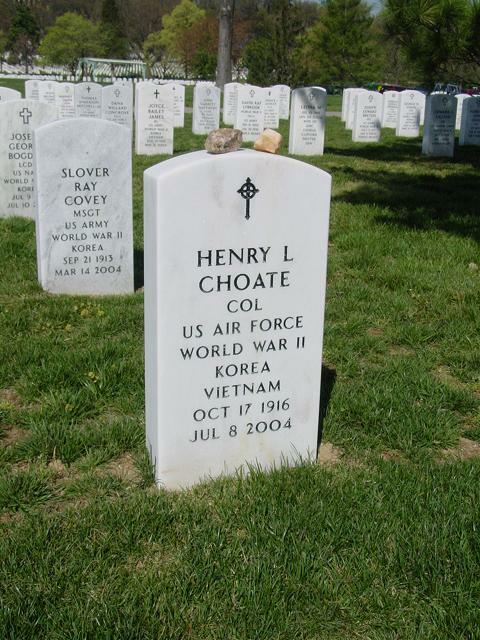 Henry Lee Choate, 87, a World War II bomber pilot who rose to the rank of Air Force Colonel, died July 8, 2004, at the Gables at Mount Vernon, an assisted-living facility in Alexandria. He had dementia. Colonel Choate spent more than 27 years on active duty, beginning in December 1942 with the Army Air Forces. He flew 50 bombing missions in the Pacific theater during World War II and later became a B-52 pilot. In the 1950s, he was stationed in the Philippines, California and Colorado before being posted to an American air base in Uruguay in 1956 as deputy chief of the mission. From 1959 to 1964, he was stationed at the Pentagon. In 1964, he was named chief of the U.S. Air Force mission in Venezuela, where he narrowly escaped a kidnapping attempt by a radical political faction. He worked in the office of the Joint Chiefs of Staff at the Pentagon from 1966 until his retirement in 1970. His awards included the Legion of Merit and the Air Force Commendation Medal. After his Air Force service, Colonel Choate was deputy director of Citizens for a New Prosperity, a group that supported the 1972 reelection of President Richard M. Nixon. He was born in Huntersville, North Carolina, and graduated from Davidson College in North Carolina. He lived in Alexandria for more than 40 years. Survivors include his wife of 59 years, Rose Capen Choate of Alexandria; four daughters, Rosemary Choate of Fairfax County, Stephanie Choate of Stafford, Connie Choate of Fletcher, N.C., and Patricia Allred of Hickory, N.C.; and two grandchildren. On July 8, 2004 of Alexandria, Virginia. Beloved husband of Rose C. Choate of 59 years; loving father of Rosemary, Connie, Stephanie Choate and Patricia Allred; adoring grandfather of Ryan and Whitney Allred. Friends may call at DEMAINE FUNERAL HOME, 520 S. Washington St., Alexandria, VA on Saturday, July 17, from 4 to 8 p.m. A funeral service will be held on September 2, 11 a.m. at Ft. Myer Old Post Chapel. Inurnment with follow with full military honors. Memorial contributions may be made to Community Hospice of Virginia, 520 N. Washington St., Suite 400, Falls Church, VA 22026.